Are you moving to London from the Netherlands or Belgium? Removals to London have been our passion since our removal company was founded in 1870! Each year, 300 families and companies benefit from Henneken’s excellent removal services as well as our extensive removal experience when moving from Holland and Belgium to the UK or back. 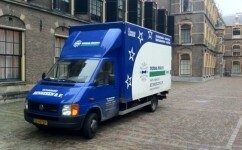 Last year, removal company Henneken was even rewarded as ‘Best removal company’ in our home country, the Netherlands! Discover why your removal to London is in good hands with our removal company! At Henneken, we love to offer excellent removal services to help you moving to London in the most pleasant and comfortable way possible! Three random examples of services we offer you are handyman service, groupage shipment and storage service. Our storage is equipped with a very modern climate control system and protected electronically against burglary and fire! Do you need temporary storage for your inventory when you are moving to London? In Henneken’s storage, your objects are definitely safe! A removal is proven to be among the most stressful events in one’s life. Since your to do list is long, the risk of forgetting important things is evident. With our removal checklist, you can make sure that your removal to London will be comfortable! Our checklist is a very useful guide, in which we share useful removal tips with you, based on our 150 years of removal experience. Please do not hesitate to request our free checklist and contact us in order to comfort yourself when moving to London! The Brexit has consequences for moving to London. Which are these consequences? What do you have to consider when you are moving to London? In our (Dutch) article, we focus on this question. Please read the article if you have any questions about moving to London after Brexit or contact us in case you might have any questions. Cheap removal to London? Think about groupage shipment! Are you searching for a cheap removal to London without quality concessions? If your moving date allows some flexibility, it is highly probable that groupage shipment will work for you. Groupage shipment means that we combine shipping your objects with other’s. For example, we move four inventories to London and two inventories back to Holland. This allows the fuel, ferry and driving time costs to be shared among multiple customers, reducing the total removal costs considerably. Are you moving to north, east, south or west London, or maybe to the centre of London? Removal company Henneken is pleased to help you moving to London in a pleasant way. Thanks to our removal experience and our knowledge about London, we know exactly how to turn your removal to London into a comfortable experience. Please do not hesitate to request a free removal quote or contact us. You can either call us (+31 (0)79 – 361 13 68) or send us an e-mail (sales@hennekenremovals.co.uk). Moreover, we are also pleased to offer you a free pre-move survey visit by one of our surveyors right away. Please feel free to make an appointment!